One of the most beautiful buildings in Mesa is the Mesa Arizona Temple. Every spring there is held a spectacular Easter procession. It is believed that it is one of the largest of its kind, in the world, taking place outdoors. Around the temple are exotic cactus gardens and the front of the building has a swimming pool, which reflects the beautiful architecture of the temple. Tall trees complement the landscape south of Mesa Temple in Arizona. The Christian church was built in classic architectural style, like a lot of pre-Colombian churches. The building consists of four ceremonial halls and nine smaller rooms. It is one of the few religious buildings that were built without towers or pinnacles. In fact, there are only two such religious structures - one is Laie Hawaii Temple, and the other is Cardston Alberta Temple. The temple was founded by Mormon pioneers back in 1919. It is the first of its kind built in Arizona. 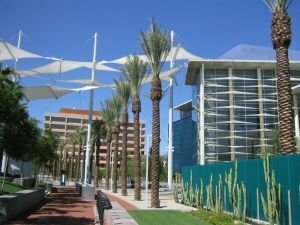 Mesa Amphitheatre and the Mesa Arts Center are also highly visited cultural attractions in this Arizona City. Interesting details about Mesa are that it stretches from east to west, over a distance of 30 km. Therefore, the locations of local buildings or sites are often determined as Eastern and Western Mesa. The city houses many interesting museums including the Museum of Natural History, the Arizona Wing Aircraft Museum, and the Museum of youth. Fans of archeology can walk around the ruins, called the Mesa Grande Ruins, and to examine the ancient irrigation channels in the Park of the Canals. Mesa has a spectacular water park, Golfland Sunsplash. HoHoKam Park is another pride of the Arizona city. There are sports events held by the Cactus League there. The stadium is open for tourist visits. It is located 20 minutes from Sky Harbor International Airport, in the north central part of Mesa. A sports facility is located in the Salt River Cantina, with many restaurants and other places to eat and rest. In central Arizona, this is a town of no high-rise construction. The only skyscraper is the building of Bank of America, located near another attractive center for residents and guests - Fiesta Mall. An interesting detail is that more than 2000 years ago Mesa had been inhabited by the Hohokam tribe. The legacy of ancient communities is preserved. It made irrigation facilities and a system of channels, through which the region had begun to develop as land, and consequently a cultural and educational center. In 1883, the population of the newly formed city was not exceeding 300 people. The city's population today is around 440 000 people. Mesa is located only 32 miles from Phoenix. 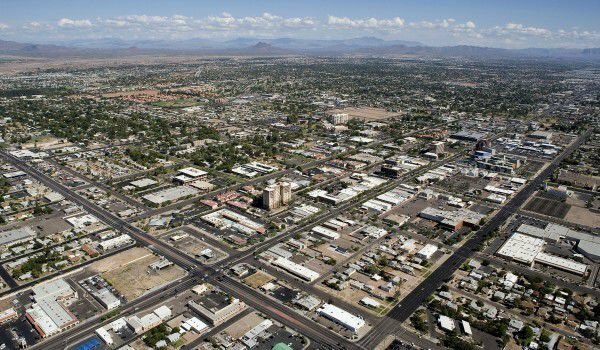 More cities bordered by it are Chandler and Apache Junction.